dhb's offering for the chilly morning commute is certainly warm enough, but lacks some key features. The mild autumn may not have been great for testing winter jackets (sorry about that), but it’s certainly allowed us to get the miles in while clad in the dhb Flashlight Windproof Gilet. Primarily aimed at commuters, this new design does a good job at keeping a nippy early morning breeze at bay. We found it to be comfortable in temperatures between the high single figures and mid teens, and could possibly push this further with a bit of windchill. The main body of the gilet also comes with a water-repellant Teflon coating, providing good protection from road spray. The loose fit means you can layer up, but the reflective strips are strangely positioned on the sides. If the front of the gilet does a good job at keeping cold air out, the back is just as adept at getting hot air out. With a large mesh panel dominating the rear you’re never at risk of overheating, as is the case in some boil-in-the-bag gilets. This does make the dhb gilet unsuitable for colder temperatures, but if you’re after a more heavyweight gilet then you’ll be shelling out more than the £34.99 that will buy you this one. Should you insist on wearing the dhb Flashlight gilet as the mercury continues to fall, then the loose fit will enable you to add a few layers underneath. 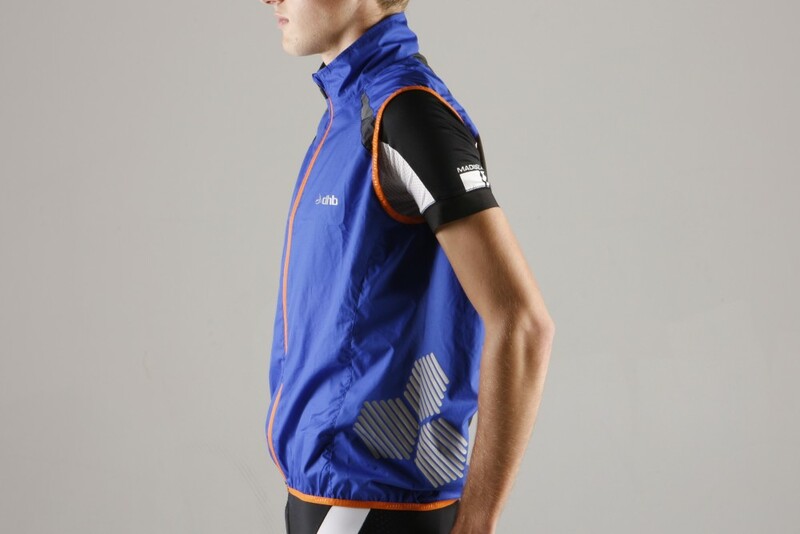 It may not be the most aero gilet out there, but this makes it a versatile addition to your wardrobe as you pair it with other piece of clothing depending on the conditions. The high fleece-lined collar is comfortable and warm. The slightly loose fit also makes it very comfy to wear, and allows it to be pulled around a bit without becoming tight if you’re commuting with a rucksack. One of the nicest touches to increase comfort is the fleece lined high collar, which is soft to the touch and helps to add a bit of warmth, while a chin guard at the front prevents irritation from the full length YKK zipper. Like the rest of dhb’s Flashlight range, this gilet features 3M Scotchlite reflective patches in an attempt to make you more visible in low light. The largest patches on the gilet are placed on the side panels, ensuring that you’re nice and visible at junctions and when turning across traffic. However for some reason dhb have chosen to place only two small reflective logos on the rear of the jersey. Of course if you’re doubly concerned about being seen after dark then you can purchase the fluorescent yellow version, but even this has a large black mesh panel on the rear with no additional reflective touches. 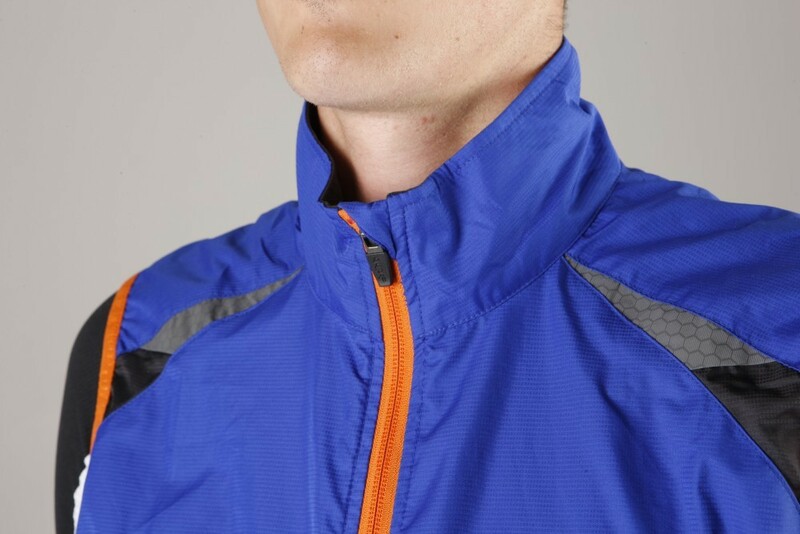 The large mesh panel ensures breathability, but the lack of pockets is a major oversight. 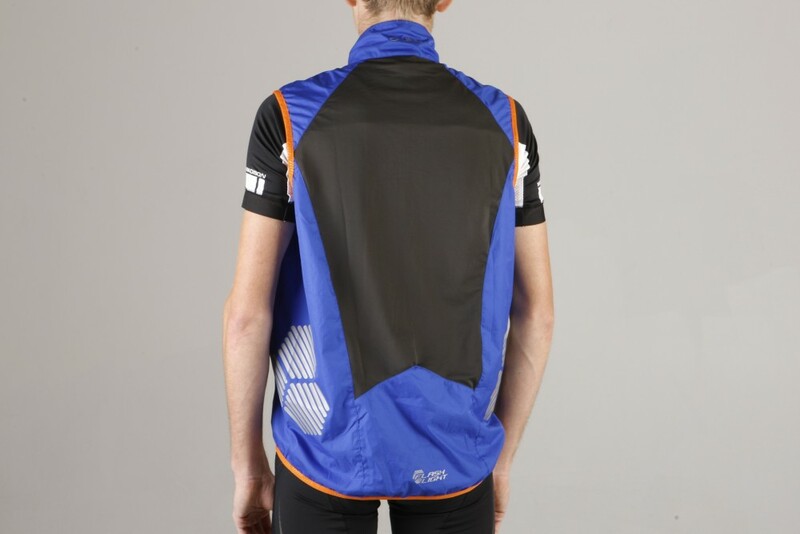 The other missing feature form the dhb Flashlight gilet was the lack of a rear pocket or two, or at least access easy access to your jersey pockets. This oversight is especially disappointing considering dhb’s identically-priced Windslam gilet includes three rear pockets (as well two zipped front pockets). The upshot of this is that getting hold of any bars/gels etc means lifting up the bottom of the gilet before fiddling around in your jersey pockets – not something for a commuter to be doing in heavy traffic. Of course the lack of rear pockets means that the bulk of the gilet is greatly reduced, making it easy to stow away once the temperature starts to rise. However as vital as this is in any good gilet, a compromise such as a zipped opening or a single rear pocket would have offered the best of both worlds. The dhb Flashlight gilet is available in blue, charcoal, or fluoro yellow, and in either a men’s or women’s version. The dhb Flashlight gilet is an adaptable and comfortable gilet which does a good job of being both windproof and breathable. However the oddly-placed reflective patches mean it's not the best for commuting after dark, while the lack of rear pockets are a big oversight.